September 4, 2014 -- I have this theory: I was born Chinese and then kidnapped as an infant by a roving band of Italian mothers. That's my story and I'm sticking to it because I can't figure out any other reason why a knockaround Italian-American kid from Brooklyn has such an affinity for all things Chinese. It's also my way of getting into this column for all of us who have to travel to what is now colloquially referred to as Greater China. When I was in Hong Kong recently, I spent some lovely days in Kowloon at the Hyatt Regency Tsim Sha Tsui. I was also in Central at the Conrad, one of the Hilton "luxury" brands. The Conrad sits atop the uber-swanky Pacific Place mall, which is a development of Swire, the uber-influential company that operates everything from Cathay Pacific Airways to a Coca-Cola bottler. But the Conrad isn't alone at Pacific Place. Another tower includes the swish Island Shangri-La. Still another tower houses a relatively sedate JW Marriott and the Upper House, Swire's signature Hong Kong lodging that many believe is the best in Hong Kong But then I took the Island Line metro east to Taikoo Shing specifically to spend some time at East, a new lodging concept from Swire. Brian Williams, managing director of Swire Hotels, touts the 345-room East as "a business hotel with a life." I don't understand what that means, but I'm not worrying about it because East is one terrific hotel for business travelers. It's almost totally paperless, a relief especially during check-in and checkout, where Hong Kong hotels delight in burying you in paper. Most everything in the East guestrooms and suites is controlled electronically. There's a trendy rooftop bar, a round-the-clock fitness center and pool and a nice restaurant. There's also a grab-and-go food counter. Everything works well at East, especially the connectivity. The in-room Internet is strong and fast. There is a bag on the desk that contains a plethora of plug converters and connecting cables. An entrance to the Island Line's Tai Koo station is at the hotel's front door and that means you can connect at the Central/Hong Kong Station complex for express trains to Hong Kong International Airport. Want some cool local action? East is connected to Cityplaza, a Swire mall that has all sorts of shopping, an ice-skating rink and everything from a Starbucks to a top-line dim sum joint. To my mind, the most interesting rooms in East are actually the basic ones. Because there are floor-to-ceiling windows and an open space layout, the accommodations feel gigantic even though they are only around 300 square feet. 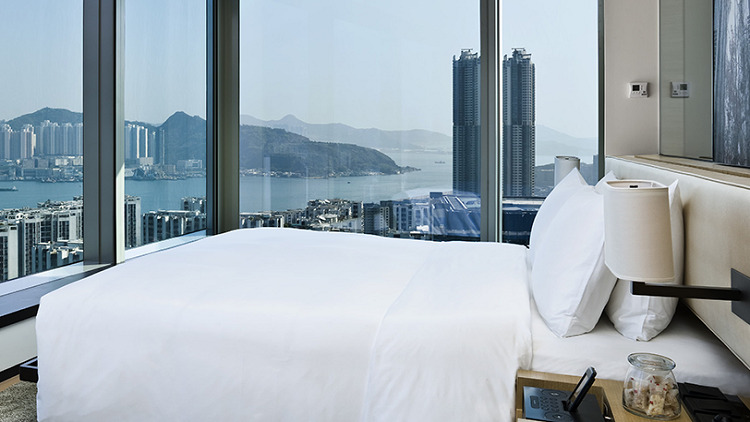 And rooms with views of Victoria Harbour look out at Kai Tak, Hong Kong's former airport, which is now the city's cruise port. Prices are gentle by Hong Kong standards and start at about US$210 a night. Considering that the United States and mainland China are the world's largest economies and that Chinese business travelers will soon spend more than us on the road, it's distressing that there's so little nonstop U.S.-China service. Chinese carriers serve Beijing, Shanghai and Guangzhou and China Southern may add a San Francisco-Wuhan route before the end of the year. But U.S. airlines have limited themselves (or have been limited) to Beijing and Shanghai. At least that was true until United Airlines in June launched Boeing 787 nonstops from San Francisco to Chengdu, capital of Sichuan Province and key hub for Western China. And this is clearly Chengdu's 15 minutes as a raft of luxury hoteliers rush into the market. St. Regis opened its 279-room Chengdu branch this week, just a few days after Ritz-Carlton opened its 353-room Chengdu outpost. Hong Kong's Shangri-La group and the Kempinski chain also have luxury hotels in Chengdu and there are more mainstream brands from InterContinental, Starwood and Marriott represented, too. But the Chengdu property that I'm waiting for is Temple House, the third in a series of House properties from Swire. Even Brian Williams, the Swire Hotels managing director, seems awed by what is going on at Temple House, a 100-room luxury hotel being built around an historic Chengdu temple. "To say it's like nothing we've done before misses the point," he told me over breakfast recently. "No one's done the amenities and service features we are going to do in Chengdu." We'll know soon enough. Temple House is due to open its doors by the end of the year. If we don't have enough nonstop service to Chinese cities, at least we're getting more nonstop gateways to the Chinese destinations that are already on the route map. Case in point: Boston's Logan Airport. Hainan Airlines launched New England's first China nonstops in June when it linked Logan with Beijing. The well-regarded Hainan is flying Boeing Dreamliners configured with flatbed seats in business class and (regrettably) 9-across seating in coach. Cathay Pacific announced two weeks ago that it will launch Boston-Hong Kong nonstops in May. What struck me about the Cathay move is the decision to operate the four weekly Boston flights with a first-class cabin. Outfitting the Boeing 777-300ER with coach and Cathay's top-notch premium-economy and business classes makes sense, of course. But when Cathay launched its Newark-Hong Kong nonstops earlier this year, it omitted first class. I expected a similar call on Boston. "We think there's enough first-class demand," says Tom Owen, Cathay's senior vice president for the Americas. "The tech and university markets should be good and we'll be drawing from all of New England for the flights." Besides, Owen says, he expects there will be enough first-class seats from Boston for some upgrade and frequent flyer award travel, too. The other intriguing point about Cathay's Boston service is that it doesn't connect to a Oneworld Alliance hub and that means no feed from American Airlines or US Airways. And when you consider that US Air's Philadelphia and Charlotte hubs don't have Hong Kong nonstops, Boston flights are even more notable. "Boston jumped out because it was the largest market that we didn't cover," Owen explains. "I know that we'll have to build our own feed and not rely on Oneworld, but I think the traffic to Hong Kong and beyond will justify our decision." Swire now refers to East as a "business lifestyle" hotel. I don't know what that means, either, but it is clear travelers get the message. TripAdvisor.com ranks East at No. 47 in the very crowded Hong Kong market and it rates a 4.5 from more than 1,300 traveler reviews. The rooftop bar, Sugar, is now a place to see and be seen. The expansive harbor views draw the tourists. The restaurant, Feast, draws mixed reviews, but the adjacent CityPlaza has many good places to dine. This column is Copyright � 2011-2019 by Joe Brancatelli. JoeSentMe.com is Copyright � 2019 by Joe Brancatelli. All rights reserved. All of the opinions and material in this column are the sole property and responsibility of Joe Brancatelli. This material may not be reproduced in any form without his express written permission.